At the Turfhall Cheshire Home, we provide 24-hour specialised, residential care to 60 severely disabled adults from previously disadvantaged communities. 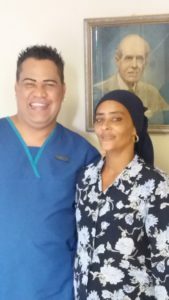 We opened our doors on 10 November 1984 and are a registered non-profit and public benefit organisation (NPO 014-845 & PBO 930025578). 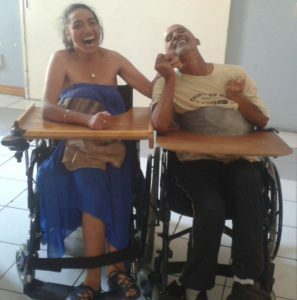 We would like to further our organisations mission to assist people with disabilities throughout the world, regardless of their colour, race or creed, by providing the conditions necessary for their physical, mental and spiritual well-being. 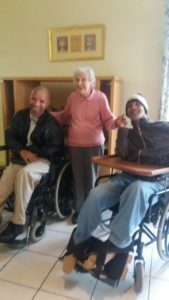 Carers assisting a resident to be transported to an appointment..
Head of Care Mr Naiem Davids and Senior Carer Mrs Gaironesa Muhammed. 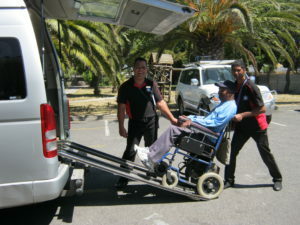 Although we run independently, we are affiliated to the international Leonard Cheshire Disability Global Alliance. Lord Leonard Cheshire, a highly acclaimed Royal Air Force pilot during World War II, who received the Victoria Cross for gallantry, started the charity for disabled ex-servicemen in 1948. This act of kindness resulted in more than 270 homes all over the world. 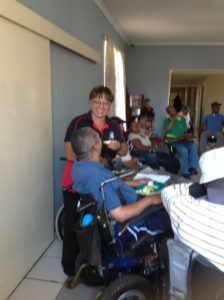 In South Africa we have 45 independent living units and 17 residential homes of which the Turfhall Cheshire Home is one of 3 in the Western Cape. 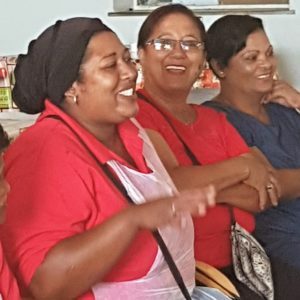 Each home is responsible for their own funding activities. We are grateful to our Donors and the Department of Social Development who have supported us generously over the past few years. 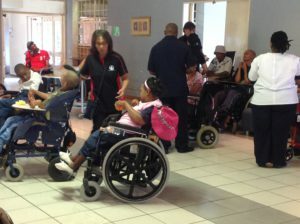 However with rising costs of electricity, water, food and fuel; we have to actively source funding to ensure we can provide the accommodation and care for our severely disabled residents. 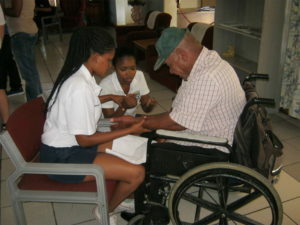 Currently we have a shortfall of R2500 per resident per month. 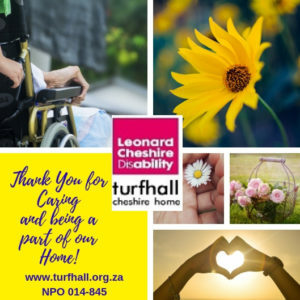 We are appealing to Companies, Trusts & Foundations, Individuals and Members of Service Organisations to consider supporting the Turfhall Cheshire Home for possible financial assistance towards our Projects or the 24 Hour Specialised Care Program to ensure the sustainability of our home. 100% of donations go directly to the Turfhall Cheshire Home and a receipt for donations received in terms of Section 18A of the Income Tax Act No 58 of 1962 will be issued. Any donation, or gift in kind, no matter how small, will be much appreciated. Please, WE need your HELP, to ensure the sustainability of the Turfhall Cheshire Home. or 071-6056708, to show your support. to receive a Tax Receipt.